After working hard on increasing my endurance for the last six to seven months, I’m ready to push my body and gain some speed back. The first question I ask myself is…….How am I going to get faster? Will simply running every other day make me faster? Sure, running several days a week will make me get better. However, at some point, I will plateau. Since I have been running for so many years, that plateau will appear rather quickly for me. 1. chose a plan that includes both running and cross training. I choose to cycle as my cross training. This type of plan allows for higher intensity workouts since I won’t be running every day. I will run 3 days a week and cycle 2 days a week at first. Then, I will transition to 4 days of running and 1 day of cycling. This way, my body will get a chance to rest before I have another run workout. 2. Every workout will have a purpose ie: hill repeats, tempo, interval, long runs. Each week, I will include these different types of workouts. “Hill repeats are repeated short segments of hard uphill running. They increase aerobic power, high-intensity fatigue resistance, pain tolerance, and run-specific strength. The ideal hill on which to run hill repeats features a steady, moderate gradient of 4 to 6 percent. Hill repetitions are typically done at the end of the base-building period as a relatively safe way to introduce harder high-intensity training into the program. A tempo run is a sustained effort at lactate threshold intensity, which is the fastest pace that can be sustained for one hour in highly fit runners and the fastest pace that can be sustained for 20 minutes in less fit runners. Tempo or threshold runs serve to increase the speed you can sustain for a prolonged period of time and to increase the time you can sustain that relatively fast pace. You can learn/read more about these types of runs and other types here. 3. Use either time or heart rate to help manage. Don’t get stuck in a rut. If I just go out for a run, I tend to run at a pace with a certain comfort level. However, I need to increase my pace or get my heart rate up for parts of the workout in order to make any progress. Basically, if I want to run faster, I have to teach my body how to do it. Wish me luck! I’ll let you know how it’s going. I’m now into week 3 of my rest and recovery phase. I started my reverse taper last week and am continuing it this week. Last week’s mileage was really quite low. However, I’ll log 20 miles this week. From there, I will start my next training cycle. You may be wondering what is next on my agenda. Well, after spending so many weeks building my endurance for my recent 50k, I realized that I miss a few things. I miss my short runs with high intensity. I miss my tempo runs (I have been doing some tempo runs). I miss my hill repeats. What this all points to is that I want to train for shorter distances and build up my speed again. And, I will still be able to run long (although, after running the 50k, I have a new perspective for the phrase -run long) on the weekend. Even though I loved all my long training runs, I won’t miss being away from the family for half the day. When I train for shorter races, I can get up early and knock out the workout before the kids even wake up. It just seems more doable for me. For the next few months, my focus will be on the half marathon distance. I found a few of them that I’d like to run. The first one is Run on the Sly and is in August. This race will be fun to run and try to beat my time from last year. Last year I ran the race with just 6-7 months of trail running experience. This year, I have a whole lot more! After each big event (A race), I start the last phase of my training cycle, rest and recovery. This phase is meant to give my body and mind some much deserved rest and recovery. After running hard for several weeks, my body needs a break and time to repair the muscles. This way in a few weeks, I can start demanding a little more from it. During this phase of reset and recovery, I usually cycle and may go on a few small runs. No workout is demanding and each workout is less than an hour. My mind also needs a rest from following a training plan (even though I love my training plans). It’s a nice feeling to know that I don’t have to get a certain workout completed. I don’t have to pay attention to a specific type of running, time nor mileage. I can just run. Normally, I have a project planned to help me stay busy since I’m not running as much. Unfortunately, I don’t have a project nor am I able to run at all. Needless to say, I’m a little on edge. After my 50k run, I noticed that I was physically exhausted for a few days. I basically did nothing for a few days and let my body rest. This isn’t easy for me to do as I love to workout. However, I knew that I needed to listen to my body. In addition, I am dealing with a bad case of poison oak and a cranky ankle. Both of these issues have caused me to rest for a few extra days which really isn’t the end of the world. And, I did get a few workouts in on the bike. So, I really shouldn’t complain. I’m happy to say, that after my trial run yesterday morning, I am feeling well enough to start my reverse taper. I will use the last 2 weeks of my previous training plan to help me keep my mileage low in order to rest and recover. While the mileage is low, this phase will help me gently get ready for my next training plan. Do you follow the periodiaztion phases? Do you love/dislike the Rest and Recovery phase? How do you get through Rest and Recovery? Does your training go perfectly all the time? I can’t say that mine does. I think that most of us hit a few bumps along the way. Even though we all deal with these inconveniences, some of us are more vocal about them than others. These bumps are what I call, “Freak Out,” moments. Looking back at all the training I did for my recent 50k run, I’m surprised at how smoothly it went. Well, at least up until the last few weeks. I’d say the first 16 out of 20 weeks went very smoothly. Then, about a month before my event I started having a few “issues.” Of course, I react to these issues, seeing that I have put so much effort into training for this event. I do realize that there usually is another event that could be a substitute. However, I am usually fixated on the chosen event. Although I may have mentioned some of these issues in person, on my blog, or on my Facebook page, I didn’t mention them in my recap post. I thought it’s only fair that I tell the whole story. Plus, it makes me appreciate how well race day went, considering what could have gone wrong. Freak out moment #2: Again, due to worn out shoes and orthotics, my ankle started hurting and was slightly strained with every subsequential run. Freak out moment#3: After my last long run, my hip became unaligned. I have been dealing with SI Joint issues for around 3.5 years. Thankfully, with a little help from a great physical therapist, Mike at Beretta Physical Therapy, I was able to get back to my running (It’s not as simple as it sounds to keep my hip in place). You never know what issues are going to arise during training. But, I figure nothing is ever going to go perfectly. Even though I freak out, I eventually have to deal with it and move on. And, sometimes, I even look back and laugh. It’s no secret that I like plans. I like to dream about my adventures, find the right plan and then watch it become a reality. Checking off the workouts or the weeks is just as satisfying. I follow my plan so that when the event comes around, I am well prepared. At times I will deviate from the plan, but rarely. I am working on becoming more flexible as I know that there are times when I shouldn’t run and I do anyways. Pace – I will start at a 10:30 – 10:45 min/mile pace. It should be an easy effort. I can slow down if I find it to be too fast. Hydration – I will carry about 30 oz of water in my pack. I plan on stopping (at the turn around point to refill my pack and again at the second to last aid station. Fuel/Nutrition – After working on my nutrition for several months, experimenting with the number of calories as well as with the type of calories, training my body to tap into my fat reserve to decrease the number of calories I need to eat out on the trail, and visiting Sheila Leard at My Nutrition Zone, I now know that I need 125-130 calories per hour. By knowing how many calories I need, I won’t over eat and I reduce the risk of having any gut issues. I’ve been training with these foods, so I’ll be using them, nothing new at this point. Each piece is ~110 calories. Each pack has 10 chews is 160 calories. 8 chews per hour for me. I also practiced with potato chips. So, if there are any on the course, I know that I can eat them. I will put a Larabar in my pack for back up. I will start to eat 1/2 hour into the race to make sure I don’t fall behind. I will take 1 salt tablet every hour until the halfway point. Then, depending on the temperature (if over 70 degrees), I will take 1 every 1/2 hour. To help me stay mentally strong, I’m going to write down the distance between each aid station on my arm so that I can focus on running from aid station to aid station rather than the whole 50 kilometers. This tactic was suggested by a fellow blogger. I recently read in Runner’s World that it’s a good idea to set up different a few different goals. That way you can still feel good about the event, even if it doesn’t go exactly how you’d like it to go. I know that when I finish, I will feel proud no matter how long it takes me. On a good day, I will go out slowly and I will cross that finish line. These are my main goals since this is my first 50k. I trained hard, so I won’t give up! When I Can’t Run on the Trails………. Where is your favorite place to run? I have grown to love the trails around El Dorado Hills and Folsom. And, I know that there are many other trails to explore in the Auburn area. 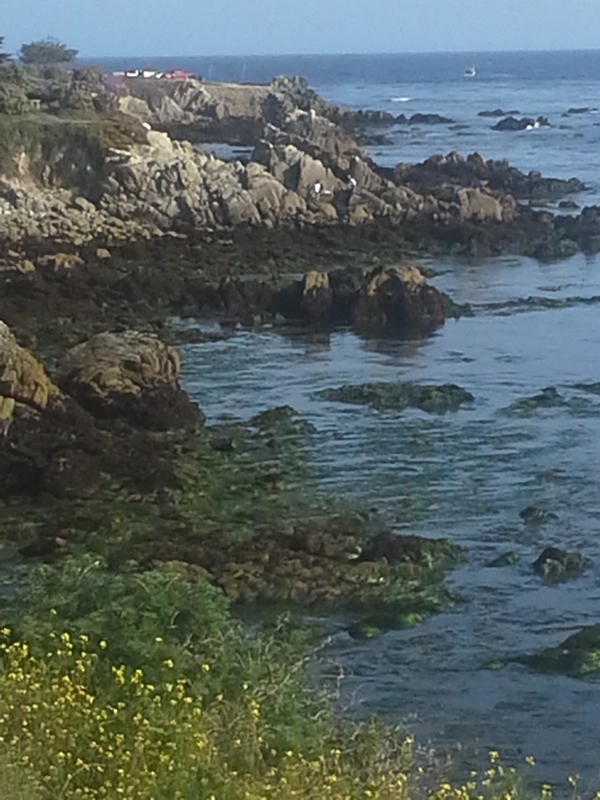 However, when I can’t run on the trails, my second choice is to run near the coast. 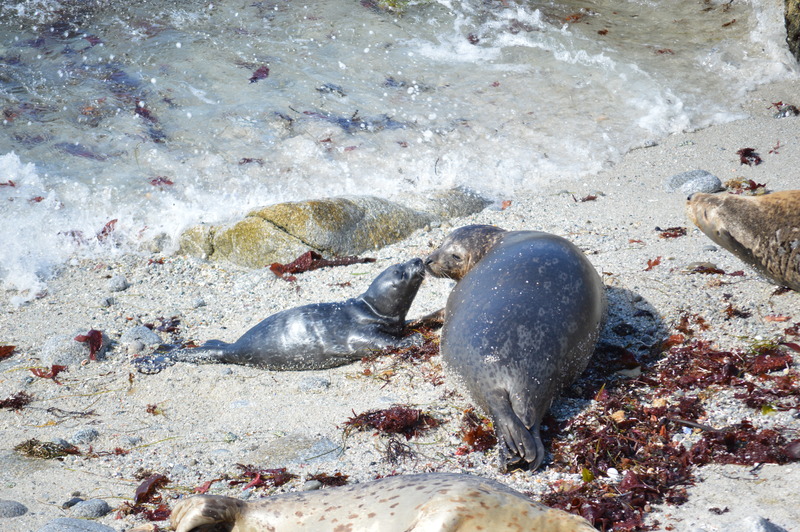 This past week we spent a few days in Monterey, CA. 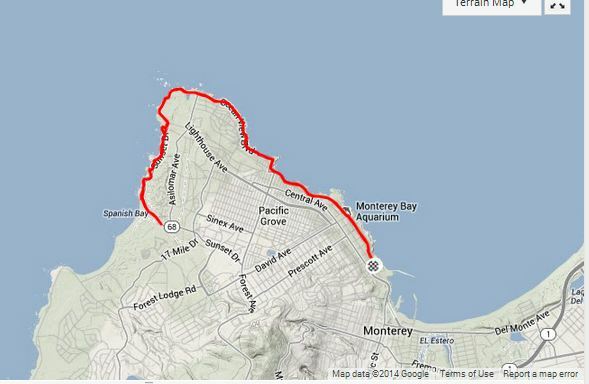 Even though I am familiar with the main trail in Monterey, I don’t know any actual dirt trails in the area. Plus, I didn’t have the time to drive to a different location to run. So, I opted to enjoy a scenic run right from where we were staying. 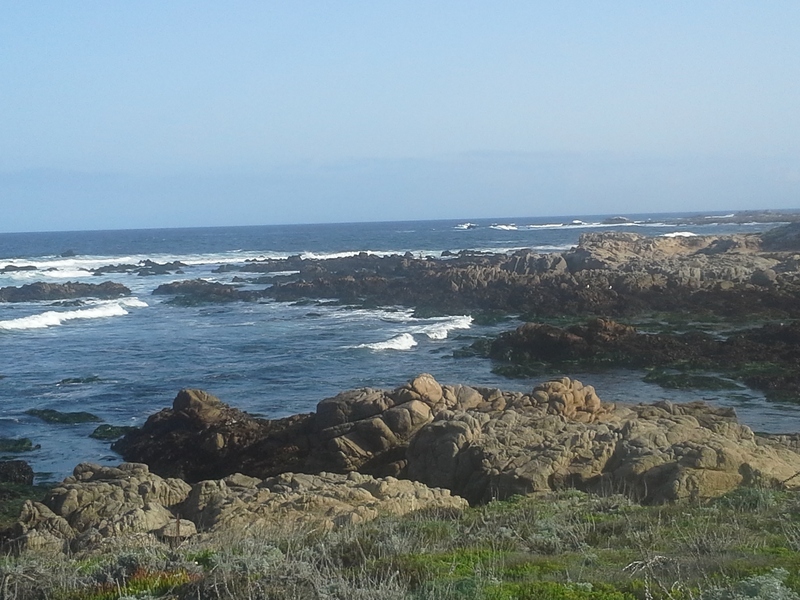 I started from San Carlos Beach and ran 5 miles out to Asilomar before turning around. The trail was paved with some crushed granite along the side. I even had the chance to run on the sand in a few spots. Since I was running in such a beautiful place, I had to stop and take a few pictures along the way. There was a lot to see. Now that it’s spring, there were lots of blooming flowers. 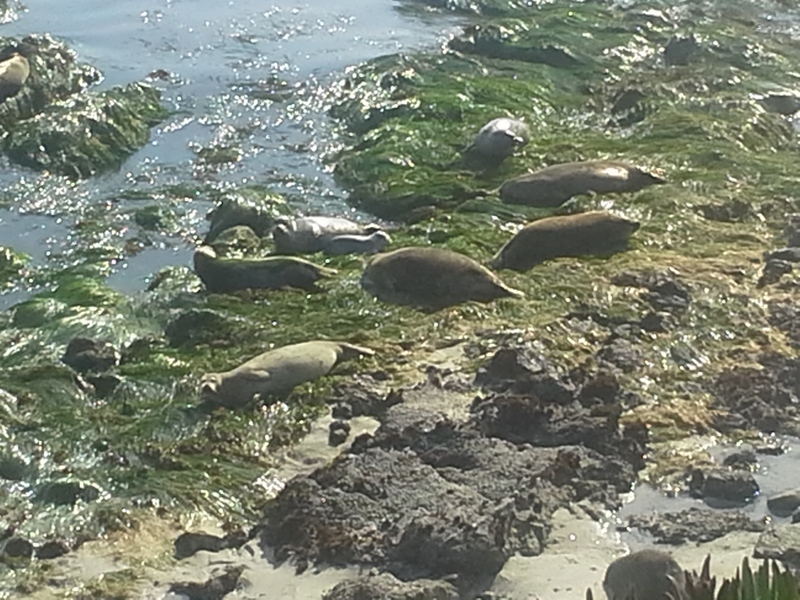 There were plenty of baby Harbor Seals to watch. 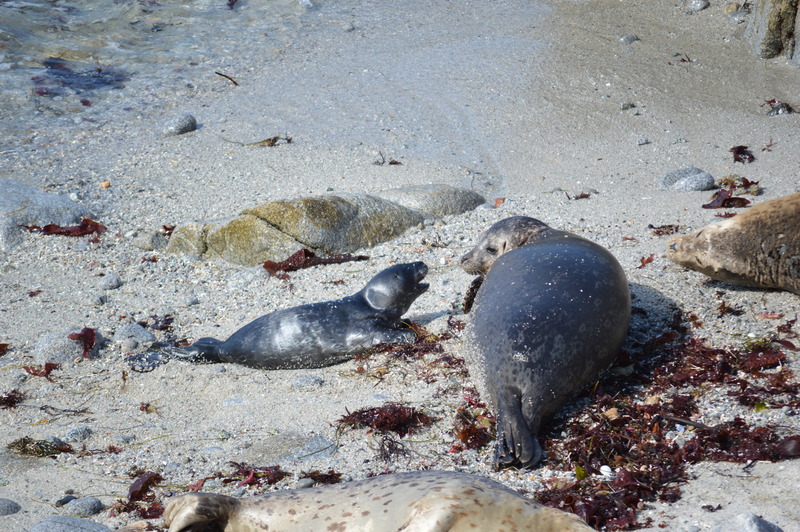 This mama and pup pair caught my eye. They were so cute!!! I later took my family to see them. Having this as a backdrop while I ran was amazing! The 10 miler (5 miles out and back)! 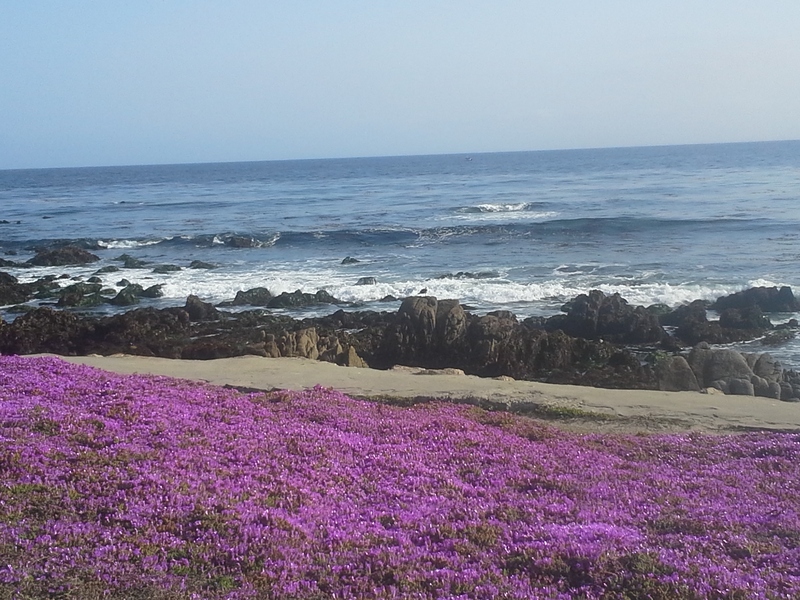 Do you know any dirt trails in the Monterey area?